The U.S. Department of Health and Human Services (HHS) has taken the National Association of Insurance Commissioners (NAIC)'s advice not to impose a nominal cost sharing in Medicare Supplement insurance Parts C and F. Kathlee Sebelius, a former NAIC president herself, wrote in a letter to current NAIC President Jim Donelon "I value the NAIC's expertise on Medigap and other health insurance issues and the strong partnership between NAIC and the U.S. Department of Health and Human Services. This partnership has been instrumental in the effective implementation of numerous provisions of the Affordable Care Act." The HHS had requested under PPACA that the NAIC revise the NAIC Medicare supplement insurance model to include a nominal cost sharing in Medigap Plans C and F to encourage the use of appropriate physician's services under Medicare Part B. However, last December, the NAIC recommended against this nominal cost sharing and did not revise the standard benefit packages for these model plans. Besides studying the issue, the NAIC communicated caution with proceeding with nominal Medigap cost sharing because it could delay treatments that people really need. This would make the more vulnerable populations worse off in the long run with costly hospitalizations and emergency room visits. Also, when referencing the changes to Medigap's plan offerings that started in 2010, the NAIC stated "We are still learning the impact of these new offerings on both the Medigap market and to the Medicare program." Despite the HHS agreeing to not go forward with these changes, the Medicare Trustee report has projected that the trust fund that finances Medicare's hospital insurance coverage will stay solvent until 2026, which is two years longer than it was projected last year. Additionally, Medicare Part B and Medicare Part D are both projected to remain funded into the foreseeable future because current law automatically provides financing each year to meet the next year's expected costs. Are you glad the HHS has taken the NAIC's advice not the impose nomial cost sharing? Are you surprised by the decision or were you expecting it? The Medicare Supplement market continues to have long-term sustainability. By 2022, almost 68 million consumers are expected to be enrolled in Medicare. The recent growth in the Medicare Supplement market can be attributed to the number of Medicare enrollees growing by 11%, as well as a recent slowdown in the growth of Medicare Advantage enrollments. Additionally, employers have continued to remove Medicare-aged retirees from their employer health plans further supporting a growth in Medicare supplement sales. Medicare Supplement enrollments are projected to continue to grow over the next ten years, creating ample opportunities for insurance carriers, agents, and marketing organizations in the senior market. Overall Medicare Growth: The ongoing growth in the Medicare market from Baby Boomers will increase the number of Medicare beneficiaries by 17 million over the next 11 years. The total number of Medicare beneficiaries in 2022 will be 34% higher than in 2012. Medicare Advantage Funding Reductions: Over the past few years growth in Medicare Advantage enrollment has slowed. Predictions show that enrollment will plateau when additional bonus payments from the quality based demonstration programs end after 2014. Decrease in Retiree Health Benefits: Companies and municipalities are eliminating or altering health care benefits for their retirees due to economic changes. Many are now offering those retirees a monthly stipend to purchase their own Medicare Supplement or Medicare Advantage coverage. All these factors show a positive outlook for the Medicare Supplement market in the upcoming years. If you are considering getting into the senior market – now is the time! With 10,000 seniors becoming eligible every day the market is booming with no signs of slowing down. To read the entire 2013 Medicare Supplement Market Projection by CSG Actuarial, please go here. What do you think of CSG Actuarial's findings? Have you seen an increase in your Med Supp business as well? In 2013, there are currently 14.4 million Medicare beneficiaries enrolled in Medicare Advantage. This is an increase of more than one million (9.7%) from 2012 and sets a record high for enrollees. Even though there were concerns that payment changes from the Affordable Care Act of 2010 (ACA) would lead to fewer enrollments, it has seen an increase of 30% since 2010. About 28% of Medicare beneficiaries are enrolled in Medicare Advantage plans today and there is very little evidence of an adverse effect on enrollment in low versus high cost counties as a result of payment rate change in the ACA. Don’t overlook the importance of adding a competitive Hospital Indemnity Plan to your senior care portfolio. This growth is a continuation of the rapid growth in enrollment that occurred at the same time as the introduction of Part D in 2006. Also, the implementation of other changes to the Medicare Advantage program authorized by the Medicare Prescription Drug, Improvement and Modernization Act (MMA) of 2003. 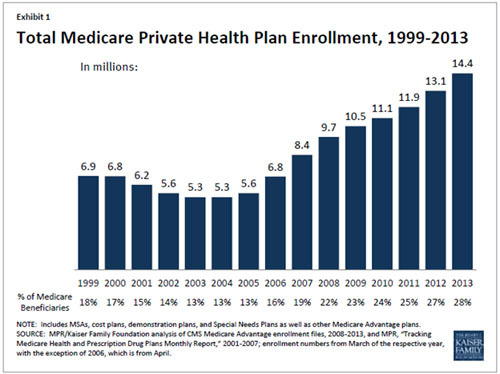 This growth has happened despite the fact that the average number of plans available to enrollees nationwide declined from a high of 48 plans in 2009 to only 20 plans in 2012 and 2013. With the Annual Enrollment period coming up, be sure to check out our Medicare Advantage product portfolio to make sure you have the best company rates in your area. If you have any questions about the products we offer or the Medicare Advantage market, please call our marketers at 1-800-998-7715. Have you seen an increase in your Medicare Advantage business? Does this news make you want to add Medicare Advantage to your senior market portfolio? When things are going well, picking the low-hanging fruit works and your business continues to run. The process is easier and it’s comfortable because you’ve gotten so good at the technique needed to turn those prospects to clients. Some producers continue with this method because they feel like the risk isn’t greater than the reward. Take courage to stretch yourself and your business! Obviously you should continue to pick the low-hanging fruit, however at the same time you should “keep your ladder handy” for those higher opportunities. The important thing to remember is not to get lazy or into a rut. Remember that picking the low-hanging fruit is a complacent, low-energy, passive activity. When you reach higher, it’s more strategic and proactive. Plus, the low-hanging fruit will not always be available. In order to prevent decreases in your business, implement a diversity strategy so you can continue to bring in revenue from different sources. For some this will be identifying a new niche market to get into. Choose one that isn’t being served or one that is maybe being served by a competitor you know your business is superior to. For others it will be assigning different members of their staff to the low-hanging fruit which leaves them time to pursue new markets or challenges in order to expand their business. If you’re only concentrating on the low-hanging fruit you aren’t paying attention to the bigger picture and your business could get blind sighted. The Titanic is a good example. No one thought the ship would sink. However, it did. What sunk the Titanic wasn’t the ice they could see but the ice they could not see – the ice they neither anticipated nor planned for. Have your plan ready for the circumstances outside your control; you and your company depend on it. What do you do if your business gets into a rut? What suggestions do you have for other agents who might be facing the same problem?